Yesterday we saw how offensive touchdowns are much more important for success than field goals. But let’s not stop there. If touchdowns are important, it’s not enough to just rank teams by the number of touchdowns. Some teams have more opportunities or have worse field position. Instead of just counting overall touchdowns, we can weight them by how many yards, plays, or drives each team needs to get one. With that in mind, I calculated touchdowns scored per all three factors in the 2010 season. Each measures something slightly different. 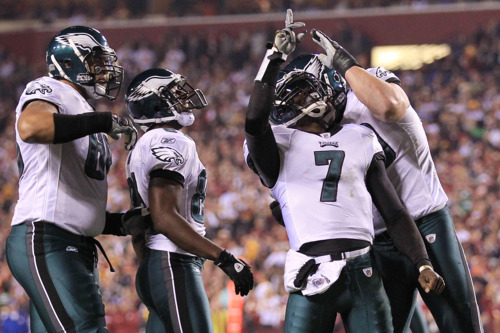 For example, the Eagles were 8th in Yards per TD, 5th in Plays per TD, and 7th in Drives per TD. Fairly close, but the best showing in Plays per TD probably reflects the huge number of big plays and long touchdown catches last year. 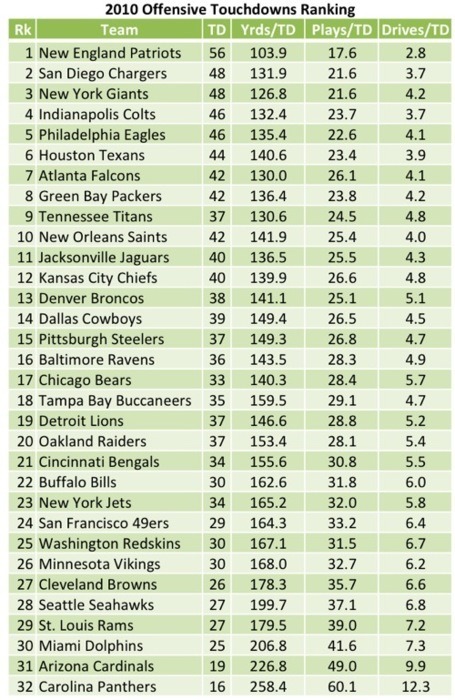 Below you’ll find the full chart of all NFL teams, best offense to least according to the average rank of these three measurements. It likely gives a more accurate picture of the best and worst offenses than any ranking that accounted for field goals or other methods of scoring. Tomorrow we’ll bring the ranking one final step further. Tagged with Philadelphia Eagles, NFL, Offense, Touchdowns, Yards, Plays, Drives, Statistics, Charts, Rankings. June 23, 2011 by Brian Solomon.